@Ralizah At the moment, one rather old non CRT tv. However I have been very conscientious and all the wires are labelled and can be swapped out quickly. I am keeping my eye out for a half decent CRT but because of the current retro populatiry, they are a lot harder to come by where I am then I thought. I have a hankering for making a Wii U my next purchase from a collectors perspective. @KALofKRYPTON It's a smaller game that launched alongside Star Fox Zero. I believe you're watching different security cameras to find intruders. Like SFZ, there's heavy GamePad integration. @Rudy_Manchego Not a bad idea. I don't know about the UK, but in the U.S., the games are QUITE cheap right now (they always are, before the prices start to universally rise once they become popular as retro consoles). @Ralizah Huh... sounds alright enough. @Rudy_Manchego if you're getting a WiiU, sooner rather than later would be better. Hardware prices are steadily creeping up - and there are already a handful of games that are way more expensive than they should be. @Ralizah @KALofKRYPTON That's what I am thinking. I can get one unboxed second hand for under $100 and have seen some games are still quite cheap but I have also seen the price increasing. I own a switch and obviously a lot of games are ported but some will just get more and more expensive. Think I will make it my next retro (ish) purrrrchase. @Rudy_Manchego If you can get the black version, go for that. It's the one my daughter had. Nice little system. @KALofKRYPTON Yeah probably will - it is a little bit more but I think it has the 32gb storage and since I won't use the online store much, should be sufficient. @Rudy_Manchego If you only download stuff like SNES games, then the 32GB will likely serve you fine. Although be prepared for XCX's downloadable data packs to take up more than half of that space. You'll also likely need to expand your memory if you want to download Fatal Frame 5 (although, if you're doing the collector thing, you should try to find that gorgeous European special edition that was released). Well, late Friday I discovered that after several years of non-use, my old OG Crystal Xbox's laser has given up. 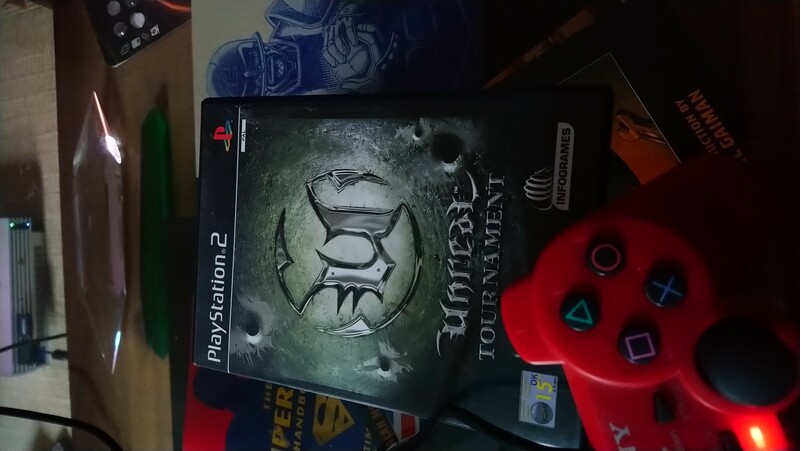 I'd only put it on to play a bit of Unreal Championship 2 as it seems I didn't have a PS2 copy of UT. Long story short, I junked the console (as I say, hadn't touched it other than to move it around in years) and took the few remaining games to cex. @KALofKRYPTON Classic. I miss bots! @Rudy_Manchego I'd almost forgotten how much I liked this version of the game. @Rudy_Manchego I've had several CRTs over the years for that very purpose (until I got decent rgb scart cables/component for older stuff). Currently have a 28" Samsung that's OK; widescreen, so not ideal - but works well enough. There are a few really good 29" 4:3 Toshibas and B&Os out there that I'd like to upgrade to at some point. Don't know if you've used the G-Con 3 set up on PS3, but it's very good. Massive shame that only 3 games use it. Pre-ordered Yoshi's Crafted World (Switch, obviously), and got my first smartphone over the weekend, so I decided to download Fire Emblem Heroes to be my F2P time killer when I'm away from home (I don't really like taking the Switch out of the house, so I only play it, and the PS4 for obvious reasons, at home). Today I decided to finally jump into the Dragon Quest series with the 3DS versions of VII and VIII. Wish it didn't cost me a combined $53 but hey, if I didn't get them, I probably would have lost the chance. As much as I've always wanted to play DQ8, since it was the title that brought the series to my attention, I started with DQ7. Purchased Ikaruga for £4 tonight on the store. I hated it whenever the GC version was out and hate it even more now. I totally see the allure and want to like it but my brain can't handle the mechanics. I know the likes of Ninja Gaiden on the og xbox and super meat boy are the gold standard in hard games. But they are cakewalk compared to this. 90% of the Trophies lock if you don't play to the default settings as well! @themcnoisy Thanks for the reminder! I meant to pick it up while it was still cheap. Playing on anything but a GC controller should be great. I was OK at it - but stage 4 onwards is really tough. Treat it like R-Type (and plenty of other shmups)- the entire game relies on memorising patterns. I picked up Metal Slug 3 and Garou Mark of the Wolves to play on the Vita. Garous is great, it was the best game I had on the Neo Geo X, so it's nice to play it again. and MS3 is my favourite of the series. Corpse Party: Sweet Sachiko's Hysteric Birthday Bash just launched on Steam today. I almost never buy Steam games when they're not on sale, but I made an exception for this, since I'm excited to finally be able to play this ridiculous game!